There’s been a steady drumbeat of reports about coal and other power plant retirements in the face of low natural gas prices, aging plants, and new environmental regulations. As discussed in a recent ACEEE blog post, electricity use has been flat in recent years, although many forecasts continue to project modest growth (e.g., EIA projects electricity consumption to increase 0.8% per year). This roughly means that as old generating capacity is retired, it needs to be replaced by new generating capacity, plus, an allowance for modest load growth in some regions. The question is, what will replace this capacity? Many reports focus on natural gas and renewable energy, casting it as a race between these two “horses.” But since energy efficiency is generally less expensive than either of these options (click here for our most recent comparison), shouldn’t it be allowed to compete in the race? Most recently, the American Public Power Association (APPA) released a report called America’s Electricity Generation Capacity 2016 Update, which estimates that over the 2008–2015 period, 90 Gigawatts (GW: a billion watts or 1000 megawatts) of power plants were retired, including 43 GW of coal. They project that an additional 45 GW will be retired by 2020, including 22 GW of coal. The APPA report finds that “natural gas, followed by wind, is the major source of new generation, though solar deployment continues to expand as well.” They express some concern about greater reliance on natural gas. The only time efficiency is mentioned in the report is in connection with higher efficiency power plants. Similarly, in mid-March the Mid-Continent Independent System Operator (MISO – the entity that operates the electric grid in much of the Mississippi Valley) released its “Midterm Analysis of EPA’s Final Clean Power Plan.” They estimate that about 25% of the coal fleet in the MISO region will be retired by 2030, based on a variety of factors including states’ and utilities’ efforts to meet the Clean Power Plan targets. They also look to natural gas, wind, and solar to replace the retired capacity, including additional transmission capacity in order to move renewable power to population centers. Their analysis does not mention the word “efficiency” once. For both of these studies, there is a modest amount of energy efficiency in their base case. But energy efficiency can save a lot more than what is assumed in a business-as-usual baseline. 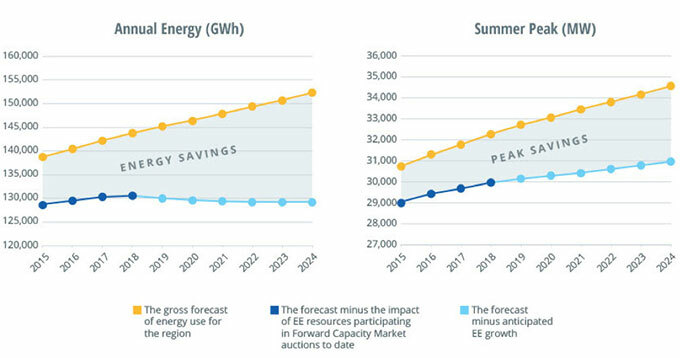 For example, the graph below comes from the New England Independent System Operator (MISO’s “sister”) forecast, and shows the large role that energy efficiency is expected to play in New England. Similarly, the just-released Northwest Seventh Regional Power Plan expects to meet nearly all of their resource needs with energy efficiency as shown in another recent ACEEE blog post. In ACEEE’s 2014 Change is in the Air report we estimate that just four energy efficiency policies (energy savings targets for utilities, building codes, combined heat and power systems and equipment efficiency standards) can, by 2020, avoid the need for 71 GW of new power plants. That is more than the 45 GW of retirements projected by APPA. Of course, power planning needs to be done on a localized level, and there will be some regions where additional generating capacity will be needed even with a lot more energy efficiency. Power planners, including MISO and APPA, need to more carefully examine what they can do to expand energy efficiency efforts, how much more can be saved, and at what cost. Work in New England, the Northwest, and at ACEEE indicates that expanding energy efficiency will reduce system costs, save consumers money, and also reduce the need for new gas and renewable energy plants. The retirement of a large amount of generating capacity presents many regions with a golden opportunity to provide electric customers with a low-cost, emission-free resource: energy efficiency. Power planners need to open the barn door to give expanded energy efficiency efforts a chance to participate in a competitive horse race. If they do, we are confident that energy efficiency can win in a fashion that would give American Pharoah a run for his money.